Take the train and save on DISNEYLAND® Resort Theme Park admission now through May 20, 2019. Plus save on train travel with our limited-time Kids Ride Free offer. Pacific Surfliner passengers will start seeing new locomotives this fall. Fourteen Charger locomotives will power the next generation of Pacific Surfliner trains, offering cleaner, greener and more reliable service to nearly 3 million passengers per year. To help accommodate the surge in travelers heading to Comic-Con, Amtrak is adding extra Pacific Surfliner trains between Los Angeles and San Diego. Ongoing construction projects along our corridor keep the tracks in top condition and contribute to overall improvements in rail travel. Upcoming projects will require temporary track closures so crews can perform necessary work. The Pacific Surfliner partnered with California Operation Lifesaver to honor Authorized Volunteer Chris Ranford for his dedication to educating the public about staying safe around train tracks. 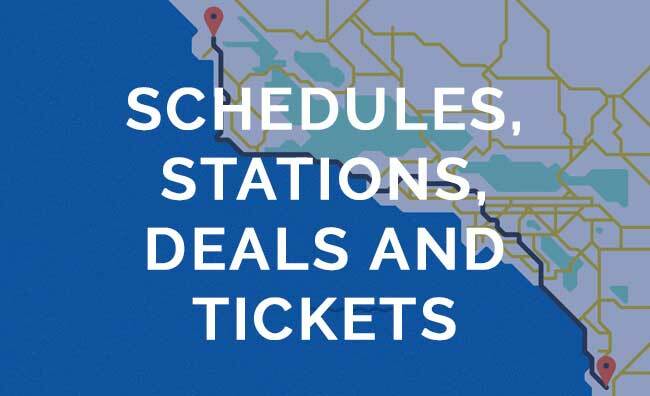 Travel by train on the Amtrak Pacific Surfliner to top destinations including San Diego, Orange County, Los Angeles, Ventura, Santa Barbara and San Luis Obispo.